Celebrities hunt for antiques across the UK. 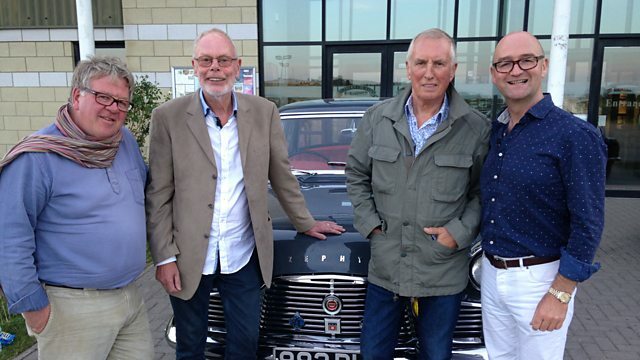 Legendary DJs Johnnie Walker and 'Whispering' Bob Harris are the celebrity guests on the hunt for antique treasure. Browse content similar to Johnnie Walker and 'Whispering' Bob Harris. Check below for episodes and series from the same categories and more! Welcome to a rocking good trip in the company of a couple of music icons. -I just like being on the road, don't you? It's just the feeling of freedom. -It's not the destination so much as the journey. have been spinning records for almost a century. -You know what this reminds me of a lot? and Phil Serrell giddy with excitement. We're seeing these guys today, I mean, they're musical legends. -Had influence on our taste. which dates from a time before seat belts were mandatory. Are they really going to be as cool as they seem in real life? -This is going to be interesting. He may be right, you know. before he began rocking the boat as a pirate DJ. I think it's very important to have a personality. always championing good music over playlists and formats. he'd forbid me from playing them when he was out. -He had Singing The Blues by Guy Mitchell. -And I sat on it. -Sat on it. Broke into bits. and voice of the ground-breaking Old Grey Whistle Test. His intimate style earning him the nickname Whispering Bob. I'm fascinated with the pirate radio of the 1960s, what about you? Well, see, for me, the Old Grey Whistle Test was just, you know. I love the pirate thing, you love the Grey Whistle Test. As well as their biggest fans, our celebrities will each have £400. -Great to meet you. Very good to meet you. -But that, actually, that's the coolest motor. -..you might be more comfortable in that one. -So we've got the cool car. -We've got the cool car. I'm sure there'll be a lot of serious talk about tactics. before arriving at an auction in Salisbury, Wiltshire. was responsible for the first mapping of Virginia. How do you feel knowing that you've got to buy some stuff? -Does it make you feel a bit, "Oh, what am I going to do?" Good, we're in the same boat, then! Just relax. Take it all in. -called his show the perfume garden. -and a few joss sticks burning for that effect. -We're not going to buy any of those, are we? Now enter Bob and Phil. We need something that says Bob Harris, don't we? this big ticket sign which I've got outside my, er, my studio. -So anything that's kind of like that but vintage. -Can you just see that that bit of cast is still in the hole? If that's been screwed to something that would've been knocked off. -Well, that's a pity, isn't it? Meanwhile, the others are busy sorting out strategy. -Just have to knock them down a bit. -Are you experienced with that? -Well, the car salesman years could come in handy, you see. And then I got the chance to go on the pirate ships. The garage manager, he said, "You must decide. -"Are you going to be a proper car salesman or a disc jockey?" "I'll give you two weeks to think about it." I said, "I don't need two weeks, I'll give you the answer now." He said, What's that?" "I'll be a DJ, thanks very much." So far, they're not looking at much but that might be about to change. would be that this is for cassettes. to put your cartridges in. -You put your cartridges in there like that. -and it brings the cartridges to the top. Now, there's a big but with this, OK? -In all these things, condition is imperative. -it's got new corners on it. -And these straps aren't quite as old as me. -look at the stitching there. -And look at that stitching there. This has got quite an expensive tag on it anyway at £160. Well, we might be able to do a lot, lot better than that. -Do you really think so? into the Bob Harris bespoke cassette holder. Cassette holder, that would be good, wouldn't it? Let's consult our shopkeeper, Anthony. which is half the price you've got on it. -Is there going to be any room for negotiation? but that's probably what he paid for it at auction in the first place. Strangely, our other legend has his eye on something similar. -That is a good label. -"The Right Honourable Lord Raglan." That's the original ticket, isn't it? "Pall Mall, SW1." -A lot of money though. harking back to your wheeler dealer days, for a song. -What sort of shooting do you do? -Yeah, I have my moments. ..and I was borrowing my friend's gun and we were just having a go. And I go, "Pull." Blew the first one out. By the fifth and sixth, I hadn't missed yet. "Who the hell's this geezer?" I got ten out of ten. My God. -What do you know about Lord Raglan, anything? I'd like to know more about him. He must be a local guy. the man who ordered the Charge of the Light Brigade? Time to talk to Tina. -I'm slightly drawn to this. -Not in a big way. -see if I can get any more information? -And a price, a best trade price. on the Bob Harris bespoke cassette case. -What I collect is buses. ..tin toys. Oh, absolutely. Yeah. I've still got some of the buses that I bought as a child. -So if we can find some toy buses, that's us. Ah, wait a minute, wait a minute, wait a minute. Are they nice, are they? The Original Omnibus Company buses, those two are sweet. but I don't think they're of any value particularly. they'd probably get less than the ticket price there, to be honest. but Johnnie's keen to exercise his car salesman skills. I'm kind of drawn to, you know, I love the number nine. So I've got 90 sort of in my mind. You've gone very quiet there, Gordon. -I do like it, I must say. We'll go for it, Gordon. I think they're GUNNA go for it. Now, anyone not on the phone? Tina, point us in the direction of a living antiques dealer. There's a lady here, her name's Jane, down the bottom. Right, Jane, we're coming to get you! Let's go and get Jane. Hello, Jane. I'm David, nice to meet you. -So, Jane, what do you know about Scamp there? -Not very much at all. -I think it's a pastel. -So it's not a print? -He's quite a little character, isn't he? -What a great name- Scamp. -It's gotta be worth a fiver, isn't it? The ticket price, however, is eight. Seven quid would do it nicely. You said a fiver a moment ago, he keeps going up. -I'm going up two quid. -Seven sounds good to me. -Er, I think we have. So it seems. Jane has something else, too. That is something I could put out for you quite reasonably. In other words you want to get rid of it. It's been around a long time. -No, I've only just brought it in, actually. It's a bit of a lump. -Needs rewiring which would be 100 quid. No label on it yet, you haven't priced it up yet. -Date-wise, Johnnie, I'm guessing that's mid-20th century. -Was it a good weight? Yeah, sounds like he's introducing a record. I reckon we'd bag that at a bargain. Over to you. Over to me. Starting about 12 quid? -You've got to give me secret signals here, mate. OK, well, I'll have that, thanks. So we'll take that and Scamp. You're not supposed to be shaking each other's hands. -Thank you very much, Jane. Let's fill the MG up! After a slowish start, they've got three in the bag for £117. and he said 120 would be, you know, round about his bottom. Can you do any round-about bit...? Between us, we have that leeway so, yes, I can do that. -I think we're there, aren't we? Sorry, I was a bit quick. Ha! There's a whole lot of shaking going wrong this morning, you know. -That's fabulous. I've even got some money for you. -I think we've done well with that. -I think this is pretty good. And out on the long and winding road are rivals Johnnie and David. -Of course, bobbing about in the ocean! Yeah, but we made up for it on our week on shore. and people just used to go there and hang out together. It was a really great scene. and tootling from Crewkerne to Sparkford. -were all having their Porsches and stuff. So I bought a Citroen 2CV. about a diminutive British beauty. -Good bit of driving there, Johnnie. -How very nice to meet you. Welcome both of you to the Haynes International Motor Museum. and opened this fine collection in 1985. But that is one of the most beautiful cars ever made. changed motoring and gave birth to a British icon. Our story starts with this quirky classic. -I'm sure you probably know what it is. No parts from this car have come from a Messerschmitt plane. that during the Second World War made all the fighter planes. thanks in part to world events. Is this a result of the Suez fuel crisis, 1956? -and we were looking at rationing again. -you didn't need a car licence. that is the forerunner of the Smart car we know today. -And, of course, there's one just there. -Mr Walker, would you like to try it? -I'd never drive one on the road. Can we squeeze David in too? -Ooh, hello. Are you all right? -It's supposed to do that. -It's even got more room than our little MGB GT. -You've got enough air for about 30 seconds. this is the full micro car, the bubble car experience. could make a little 'un. and in 1959 their top designer came up with a Mini. Alec Issigonis, he was given a very tight brief. than 10ft, no wider than four and no taller than four. The biggest thing that he did was turn the engine sideways. -Which had never, ever been done before. -So everything about this car is designed to save space. -And a very revolutionary constant velocity joint. Oh, that was...! Are you called Malcolm? I thought we were just going to talk about music! has been voted second only to the Model T.
wizardry on wheels because everything in it was so clever. Now, Johnnie, do you remember the day the Mini was released? I do, I remember all the newspaper headlines. that nobody had ever made a car that was that small. you know, you need a wheel at each corner. would dominate motorsport in the '60s. -I mean, you could drive them really fast, couldn't you? -Look at Paddy Hopkirk, Monte Carlo rally. as well as one of the bestselling British cars in history. So, if I was to say that I had the keys to a 1965 Mini Deluxe outside. -Thank you very much, Matt. It's a lovely present, we really do appreciate it. -I hope the trustees aren't watching. Johnnie, go for it. Yeah, great seeing you, Matt. -We'll see you again sometime. -Do bring the car back. -Let's leave the MG. Yeah, happy? -We've got a little Mini. Meanwhile Bob and Phil are on their own journey through the past. was the Americanisation of it that little bit. These two are making their own sweet way to their next shop. administered the world's first recorded smallpox vaccination. We've got Whispering Bob Harris and Miserable Phil Serrell. On the Dorset leg of their world tour, complete with bus. -I like the sign up there. -I love the sign up there. -Could you carry that off? -I don't think so, do you? -They are always too small. Yeah, clarinet, could you play that? -Are you sure? I couldn't either. -I wouldn't even know how to put it together. -That might make two of us. The greatest exponent of this for me was Acker Bilk. Ah, yes, the clarinet classic. that are quite old, but this is plastic and it's made in China. Oh, is it? Oh, it's still quite... It's substantial, isn't it? I wouldn't rule this out at all. -I like the musical theme for you. won't it? We'll give it a go. You could always threaten to play it, Phil. I've just noticed, Phil, this rather lovely picnic set. -We could have that in the Zephyr. -We could have that in the Zephyr! -It's the same colour scheme. -Oh, look at those. That's all there, look. Oh, yeah. It looks as if it's hardly ever been used. Joking apart, we've got the Zephyr. You know, take your tartan rug with you and picnic set. this would be the original cup and saucers for it, which is nice. Will it be both items? to me, this has got a much greater potential. -Shall I leave the clarinet there? So this is now a number one possibility. It's getting there, isn't it, yeah. a bit of business in here. -Actually, I must say, it rather suits you, yeah. Please don't encourage him, Bob. This is rather nice, look. -This is a fly-fishing box with flies. Oh, it's beautiful, isn't it? When would you say this was manufactured? I would think that's probably 1920s. It's that great British field sports age. It's got a second little compartment here as well. This is telling you the flies. a Gold Nibbled Hare's Ear. How does that grab you? You know, I really would love to get this. -I think this has got potential. How much is it? 140 quid. Whoa! That is quite expensive, isn't it, £140. That is casting your bread upon the water, that is, isn't it? a good sort of fishing area. I would kind of hope that it would work. If we could perhaps just try and put a group of things together. We've got the picnic hamper. We could perhaps find something else. We've already said no to the whistle. -I think it's probably from the '60s. Not only can you drink from these cups, you can actually play them. You've got six cups, sugar bowl and milk jug. I think they are rather attractive. I don't know what it is about them. really taking a fancy to these. Welsh tourist village, but it was sold there. The important thing is damage. very often, you know, fingers will feel damage before eyes see them. -I don't think there's any damage to these at all. Does that mean we might be talking to Mark soon? ..and we've got a £140 fly box. for somewhere between, well, £80-100 if we can. That is the cold light of day. Whether he will or not, I don't know. -What, all of them together, you mean? It would be lovely to buy them for somewhere between £80-90. -just to get our money back. I've got 210 on sale. I can't really go that low, I'm afraid. I couldn't see us going much over 100 quid for them, in truth. -Yeah. You've got a deal. Good one, Mark. and £25 for the picnic set. Not bad. Does it feel safe, Bob, with me driving? -Why, are you going to scare me any minute? Next day, we're in Devon, down by the seaside, how lovely. Look at that, Phil, the English Riviera, eh? -but it is something else really as well. Later, they'll be making for that Wiltshire auction. But first, they're about to meet up in Torquay. "There's a bit of an Elton John going on there." -So now I call him Rocket Man. You are right, though. Put a piano in front of Phil. He could turn up and do gigs, couldn't he? Until he opened his mouth, presumably, Bob. a picnic set, a leather cartridge case and coffee set. Leaving them with just under £200 still to spend. ..meaning they have almost £300 at their disposal. Right, are you off in yours and we're off in ours? Yes, we seem to have wrong partners. Bob, I'm going to deliver you over here. Just over this way, Johnnie. There you are. -I like being chauffeur driven. After that getaway, Johnnie and David are following the coast road. a stupid question, but is your name really Johnnie Walker? "we've got a lot of jingles." -So that was that, really. -Dare I ask what your real name is? -Peter Dingley's got a great cool ring to it. Whoever they are, they're heading for the delightful resort of Paignton. -Not that they've got time for a dip. -Nice to meet you. Very well, thank you. Peter. Really good to meet you. What have you got, then? Anything fantastic? We've got a treasure trove for you here. It's got to be cheap, mind. Well, I'm sure a bit of the old charm would help with that, Johnnie. Where is your special, unusual stuff, Peter? Well, if you don't ask. What's your connection with cameras then? I've just always loved photography. You know, collected cameras over the years. Kodak Jr.
What's nice about that is we've got the original case with that one. Oh, the little leather pouch? Were you out and about in the '60s taking pictures of all the celebs? Yeah, and I had a Nikkormat, which was like the poor man's Nikon. and had a few photographs published in New Musical Express. Tell me, how would that do in a auction, do you think? Because that brand, great brand, but they were the prolific makers. This was the camera for everybody. It is probably under £3, I'd guess, Peter. I'm not sure that went down well. I could do that for £15. 7.50 would be quite good, wouldn't it? It's so easy to make Peter laugh, isn't it? Yes, exactly. Just hammer his prices, he loves it. Or I'll cry, let's be honest. -What did we get to? -7.50. That's over double what you offered. -He's offered over double what I offered. -I can't believe we did that. -We're getting close to being ejected here. you get closer to Peter. I suppose I could do it for 12.50. All right, then, 12 quid. -You got to give him his 50p. I'm sure I can find 50p. Shall we do that. Peter, I'm so sorry about Johnnie Walker. I think Peter's given them a very good deal there. Quick, pay the man before he changes his mind. Jump in. I'll throw you the camera. Where does Whispering Bob come from? when I first started doing the Old Grey Whistle Test. -I am. It's distinctive, you know? -There are millions of Bobs in the world. -There are not many Whispering Bobs. in both farming and education. -Celia, this is very special. -It's very beautiful, isn't it? This is the medieval courtyard, 15th century. But completely transformed by Dorothy Elmhirst. Would you be kind enough to show us around? spend her fortune on furthering the progressive causes she believed in. of an English parson in 1919.
and moved to the Devon countryside. He realised there were different ways that you could do agriculture. There was something lacking in the British education system. something very special and they came here to do it. What condition was the estate in when they got here? It was completely ruined. There was one farmer living here. If you want to come with me, I'll show you some of it. Oh, yes, we really would. providing a huge boost to the local economy. and in 1926 established a co-educational boarding school. building this up from the ground, really? of so many different kinds of people and interests. That is what they fostered. methods that existed didn't work for all children. started a school that transformed the way that we are all taught now. the Dartington School was extremely advanced. and learnt instead whilst working on the estate. work on the land with art. And all of those things melded together. The arts were at the core of the Dartington experiment. Many outstanding figures were attracted to the hall. That influx was given greater impetus during the '30s and '40s. and inhabited rooms around the courtyard and did their work. persecuted prior to the Second World War. but also by the local community. and that legacy lasts today. as well as hosting several other educational programmes. still trying to do things differently. specialising in the arts, sustainable agriculture and social justice. because it needed too much money. which was now running out. that will work for today and for future generations. Now, this is the sort of place a pirate might warm to. smuggling and also an annual pirate festival. Probably very few of them as authentic as our Johnnie. I'm not feeling hugely confident in what we've got. we're going to find something really special. You want to go for the killer object. Blimey, pirates lacking confidence, surely not. -I'm all right, fine. How are you? I'm liking the pirate scarf there. Yes, the captain has plenty of cargo in here. Johnnie, did you use telescopes on Radio Caroline? -Looking for girls on shore. No, they used to come out for us, we didn't need a telescope. Hey, let's have a closer peek on the poop deck, eh? This is off the camera from when she was broken up. -So these are the real thing? -These are the real thing. and now made them into good quality mirrors. -How many portholes were taken off? -I like the fact it is all about recycling. are on the market. How long have you been selling them for? -Does it open up as well? Is that what you're going to do? Could a bit of ocean liner be the killer buy they're after? The ticket price however is £195. What is the trade in these? -The very best, seriously, 120. What is the best, John? -It's going to break my heart, this. -We'll be gentle with you. Now, it's been a long time since we heard from their rivals. which band would you have played in? -Oh, wow. Probably Led Zeppelin. Yeah, I would have replaced Jimmy Page. -I would have been much better than him. Personally I'm more of a triangle or tambourine man myself. -J Arthur Rank on gong. for a last look-see around the antique shops of Paignton. -Hello, Bob. Nice to meet you. -This looks as new as a pin here. The shop, I mean. Yeah, thankfully not the contents. -What's the cheapest thing in the shop? -Cheapest thing in the shop? -I'm not sure that would be practical. Anyway, Phil's spotted something a bit smaller. My mum had something very similar to this actually. -Everybody's mum had something similar. OK? So this is a mid-20th century equivalent of a stick of rock! -I think this is really, really undervalued. -What about an original gunpowder barrel? It's got the broad arrow on it. -Oh, he's got the military stamp on there, look. It's probably going to be about 1850. You could put a glass top on it. -Make it into a coffee table. -I'm a massive fan of Hornblower books. I love all the stories about old, tall-masted sailing ships. And look at the name. What is this? The Fighting Temeraire Antique Shop, isn't it? -Temeraire means brave and foolhardy. There he is. -The ticket price is £160. -What sort of trade is that, John? -19th century gunpowder barrel. It's got a lot going for it. -Yeah. That talks to me. while they make up their minds. What I love about it is I think it's very rare. It would be a talking point and it'd be something special. -And what about the rag? Obviously, it is what it is. Some people might think it's a bit scruffy. top it, but I think into auction, it gives it authenticity, doesn't it? -but it just says repro really, doesn't it? -So, do we want to try and knock him down? Batten down the hatches, eh? -It's kind of between the porthole mirror and the barrel. -I've got to get 70 for it. -65, you're going to say? This is where we walk out, pretend we're going to leave it. Well, you've just given that one away. -You might as well try it now, chaps. See if he shouts us back. -I think he's going to compromise. -There you are. Proper job. -Hey, have you noticed these? Warming pans, Johnnie. They used to sell well. 19th century. People used to hang them on the walls. They don't hang them on the walls any more. You fill them full of coals and stick them in your bed. Exactly right, but not really needed these days, eh? I'm fed up with the sight of these. I really am. You can have these for a pound. -Take them away. Yeah, I'm fed up with them. And all the dogs keep peeing on them. Now, that's what you call patination. -I'm going to give you £2 for it. -Let's take these and we'll come back for the barrel. -I'm sure someone will find a good home for those. and there's a wall clock under consideration. -I'm big on my clocks. -How much is that one? -And there's presumably a deal to be done on that? -Is that a working clock, though? -It's a bit of a project, really. Now, there's an euphemism, if I ever heard one! This would require a certain amount of DIY skill and practical skill. I have no practical skills whatsoever. To me, this is already very daunting. apologise for is the price... Well, with this, you have to start making hundreds of apologies. we've got to try and buy it, if you'll let us, around the £15 mark. while Bob turns on and tunes in. -What have you got there, Bob? could we, Phil, and not discuss it and not consider it? -Can I just stop you for one minute? I want you to give me the intro to the Bob Harris Show. -All right, let me just turn on. -This is Bob Harris Country on BBC Radio 2. -What a great moment that was! -This is the kind of radio that my mum used to have in the '50s. Sounds like it belongs in the Bob Harris Collection. -That's the first thing I see. -It's got three bits missing from it, look. -so you've got to cut the wire off. a plug on, they cut it off right at the back there, so it can't be used. -It disables it and you've then got to get it rewired. But that's just me being miserable. He's got a reputation to maintain, you know? It could make 20 to £30. Ever so easily. The price on it here is 65. -I love it and I want him to buy it. -With the best will in the world, what could you do that for? -And that's the absolute finish? -That would be it, yeah. If he offered you £30, would that buy that? -and Philip Serrell, I think I could do it for 30 quid. -What's the very best you could do that for? So, 50 for the two. -Well, I'm going to go yes, in that case. I think you've got yourself a deal. Well, neither of them may work, but they do look nice. cos that's the job done. Yes, the shops are now shut. Time to share. -It's quite a variety of things, isn't it? -These are the fisherman's flies. It's by a London maker, Ogden Smith. -That looks a bit charity shop, doesn't it? It's charity shop 15 years ago. This is what I thought. This was my theory, David. -Now, that makes it a bit more interesting. Trudy wouldn't let him in the house. -was either going to buy a record player or a radio. -It had to be. Well, this was just there and it's a Marconi. Does it have a fluorescent tuning tube? I'm not sure our experts are on quite same wavelength. I love the old radios. You had to switch them on and wait for it to warm up. It needs a bit of a conditioning. -I'd give you a couple of quid for it. -Oh, sorry... We haven't finished yet. It's not as packed a table as yours. Can I just ask what drew you to the dog? Scamp is going to become very famous and he's going to make a few quid. It's fascinating. We know this once belonged to Lord Raglan. Well, we now know that this came from Lord Raglan as well. -Yeah, but does it have an R stamped on it? Give me a felt tip. Give me a felt tip. Now, what do you think of this beautiful barrel? -Gunpowder plot, yeah. Came from a ship in Plymouth. We have reason to believe it was Nelson's, from HMS Victory. It was from the pub, the Nelson! That's where it was from! -Philip's very rude about Scamp. I think it's jealousy. I tell you what I really do like of theirs, I like the barrel. -Everything else has cost them nothing. Whereas we've got jeopardy all the way down the line. I like their picnic set. I think that's very sweet and charming. Yeah, it's not going to make much money though. I loved it, really. It's been fantastic, Phil. -I'm going to go now. -How are you feeling about all this? -ah, we don't care if we win, but I want to win! of Dave Dee, Dozy, Beaky, Mick and Tich. Now then, the two coolest dudes in Britain... Are you nervous? -We're going to do well. Confidence. -Shall we go and see? -We're going to do well. The wall clock, we're quite excited about that. Probably the most valuable piece we've got here today. Hopefully, we'll see £100 for it. Be very disappointed if we make any less than 80 for it. The pastel and pen picture of Scamp the dog. has a little dog that looks similar to that. would hope to make somewhere between 50 and £70 on it. that's one I would like. Bob and Phil spent £260 on six auction lots. While Johnnie and David acquired the same number for £196.50. But with the bidding about to commence, there's been a complaint. -All the items we've got in the auction should be as is. -That's how it is in the auction. -But look at that - personally signed by music legend Bob Harris. -We never said that about you, did we? -I'll sign all of my lots. -You were going to sign everything. We're talking about adding value. Oh, Lordy! First up, that somewhat controversial wireless. -I think we should make an official complaint. -Shall we start writing it now? I'll get Bob to sign it for you! I'm going to start my bidding at £20. 105. You won't find any more of them. A great start. Now for Johnnie's leg-of-mutton gun case. Shall we start with a tenner? -I'll sign it on the back! -I'll sign all my lots! I've got a couple of bids in, will you sign those as well? Right, anyway, 10 I've got. 25. 30. 35. I've got 40. 45. 45 in the corner. 45. And 50. 55. I've GOT 60! You work here! 65. Anybody else. At 65. Well, you can't always get what you want. How about this? Ideal for a trip in a Zephyr, what? -I'm starting the bidding at £15. -No, that is very pretty. 15, 15, 15, 15. 20. 55. With me, with me, 55. Anybody else want to join in? -55. Your last chance on this lot. Those two are our current chart toppers. Can Johnnie and David's little camera close the gap? 40? 30? 10? Thank you. £10. £12. 15. 18. 20. 22. Last chance. At £22. Being sold at £22. -We nearly doubled our money. That is all right! That is all right! It most certainly is. Now it's Bob's bits of Portmeirion. 40? 30? £20. Portmeirion coffee set 20. Tenner? 5. £6. £8. £12. 15. 18. 20. £20. On my right, £20. 22. 35. On my right, 35. Anybody else? At £35. It's a cheeky little fiver! It's a cheeky little fiver. Still upbeat, and why not? Next it's the turn of Johnnie's chandelier. Feel free to join in somewhere. It's going to go for three quid! A lot of people are looking at their feet! Shush! £10, £10, £10. Don't go shy on this one, boys and girls. At £10. Anybody else? 10? Not the worst loss ever, but it doesn't help their cause. -That's all down to you, son! -Yeah, that was your call. -Coming apart at the seams. I'm surprised Bob hasn't signed his cartridge or cassette case. Start the bidding at £20. At £20. 25. 28. I've got 30. 32. 35. -105 in the corner. 105. -You're going to get a fiver more! Almost wiped its face, but it's a small loss after auction costs. Can they catch a fat profit with this little item, though? 45. On my right, 45. Anyone else want to join in? At 45. Oh, what a shame, guys, you lost a bit of money there. I didn't know I was competitive until right now. You wait till Scamp! You wait! It's a kind of blank canvas, though, isn't it? -Because you can do stuff with it. -You could fill it full of gunpowder. Johnnie, we might have to! Start the bidding at £25? At 25? At 25. 25 I have. 25. 30. 35. Anybody else want to join in? Anybody else? 55. Your last chance on this lot. -Sold this time, then, at £55. -He should have given it a bit longer! Yes, he definitely tried his best. Start the bidding at £25. 25, 25, 25 with me. -All over the price, eh? 65 with me. With me, 65. -65. Your last chance on this lot. Being sold, going at £65. That's just about assured victory for those two, I'd say. The figures don't look good, Johnnie. They just don't look good. -Bob, what comes next? What comes next? Everything is on Scamp now. He looks pretty cool under fire, doesn't he? I'm going to take it up the front, cos it's so beautiful. I'm bringing this up the front! Who will start me at £30? 20? Who's got 10? 5. 6. -All over the place! 10. Including delivery. At 42. Anybody else? Being sold this time at £42. Scamp and Johnnie did good! -I've got a sale next Thursday, do you want a job? Finally, their bargain warming pans. You could always keep your discs in them. Well, maybe not. Right, who will start me? Who's got £20. You'll be lucky! Who's got 3? Thank you! £3 I have. -10. You're on a roll. You're on a roll. 14. A bit of history you're buying here. -14. 14. 14. Anybody else? That's good, they've done well for us. Nice to end on a positive note. -Shall we go outside and work out the numbers? and made, after paying auction costs, a loss of £29.94. but after auction costs they made a profit of £76.20. So they are today's winners by over £100. -It was an unfair fight. -We should do it all again. -We have the moral victory. -And we had Scamp! No-one else had a Scamp. -We've got to go, Bob. Go for it, Johnnie, put your foot down. Now, there must be a second-hand record shop around here somewhere. and said, "Do you fancy doing the Antiques Road Trip? "Bob Harris is doing it." I said, "OK, I'll do it." It was exactly the same with me. They said, "You'll be with Johnnie Walker." "Oh, yes!" Legendary DJs Johnnie Walker and 'Whispering' Bob Harris are the celebrity guests on the hunt for antique treasure. They travel around Devon, Somerset and Dorset, before heading to a decisive auction in Salisbury.